I’ve read a lot about a yarn store rudeness but I never thought that it would happen to me…. We went on a family holiday to a small country town in NSW. Those of you who read the last post, will be delighted to know that global community of knitters came through for me, and I secured enough yarn to finish my Nesselrode, all in the same dyelot. 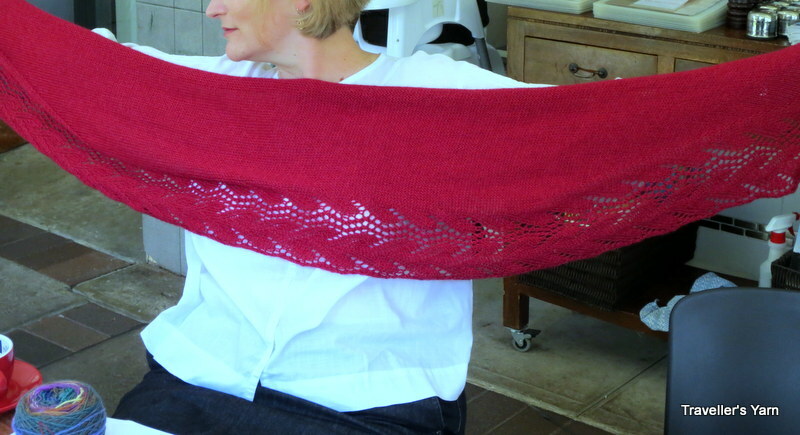 During the holiday I manged to finish the front and the back, and was champing at the bit to get going on the neck. To my mind, the generous neck is an important feature of the pattern, and I was happy to compromise on sleeve length to get the neck right. Despite owning plenty of pairs of 3.75 mm needles (one of the perks of being a former yarn shop owner), I did not bring them with me. Anyhow, I noticed that there was a haberdashery shop¹ in this small town and I decided to go an buy the 3.75mm needle from it. When I ran into the store, desperately trying to avoid getting wet in the sudden downpour that had just started, I was ignored. There was one woman working in the store who was busy chatting to her only other customer about recent social events. I perused the yarn (small, very dated selection) and even smaller collection of patterns, most of which dated back to the 1980’s. I eventually found the knitting needles, and could not locate a 3.75mm needle, or even a 3.50mm needle that I liked, so I went up to the counter with a 4.00 mm needle and a 3.00 mm needle and waited to be served. The ladies chatted, and I learnt more about the recent bowling club dinner. I waited. I wondered if there had been some improbable cosmic intervention, perhaps due to the storm, that had rendered me both invisible and soundless. The ladies chatted. I cleared my throat after another 5 minutes, and the customer collected her change and finally left. The (presumed) owner of the shop finally greeted with a curt “hello”. I asked politely if they had a 3.75 mm circular needle or double pointed needles. The owner said “they don’t make that size”. I was surprised by that statement (especially since I had many pairs of the non-existent needles at home in Sydney), but chose not to directly contradict her. I instead said “I’ll just check the pattern, I did think that they specified 3.75mm needles”. When I opened the pattern, the owner sneered “Oh, its an American pattern”, in a tone of voice which suggested that Australia was at war with the US, and I was an enemy collaborator. Despite being quite affronted, I knew that I wanted to get moving on the neck, so I purchased the 3.00 mm needle for $4.95 (figuring that I could knit looser, and that having the inside of the neck a bit smaller would be OK), and left and stewed a bit. I have had pretty uniformly positive experiences yarn shopping around the world, but if I were a beginner, the owner’s rudeness would have been truly off-putting. My lack of forward planning is especially annoying when you can purchase 15 sets (US sizes 0-15) of DPN’s here for $9.84. Get together with your mates to meet the order minimum, or purchase some buttons, and needle rolls. Of course I got back to the holiday house, and looked at the pattern again, and realised that while I had been seeking the 3.75mm needle for the neck, that I had, in fact, knitted the body of the sweater on completely the wrong sized needle. Apparently, when I decided to knit to the underarms in the round, I decided to use the sizes recommended for circular needles (4.00mm – intended to be used on the outside of the turtleneck) instead of 4.50mm needles indicated in the pattern for the body. Luckily, Nesselrode is a pattern that has a lot of ease, and the error is not fatal, even despite the slightly firm nature of the knitted fabric. 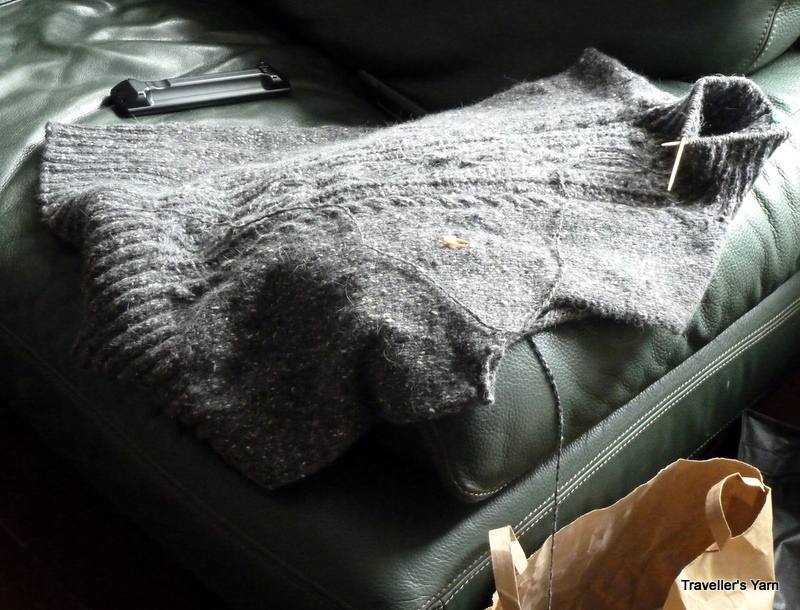 It has been a lot of knitting so far, and there wasn’t much chance of me unpicking it. 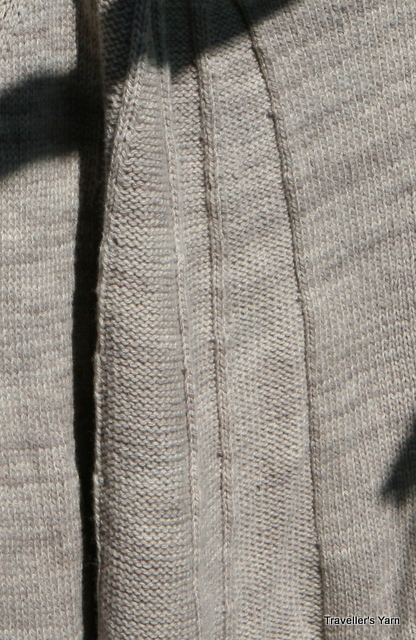 The last question is – do I knit the sleeves on the recommended size needles, or do I continue on with the mistake? 1. I’ve decided not to name the shop because they have no other internet presence, and I don’t want their only mention to be about rudeness. When I frogged the last bad hat, I was hopeful that I would get to show off a much better hat in Paris. 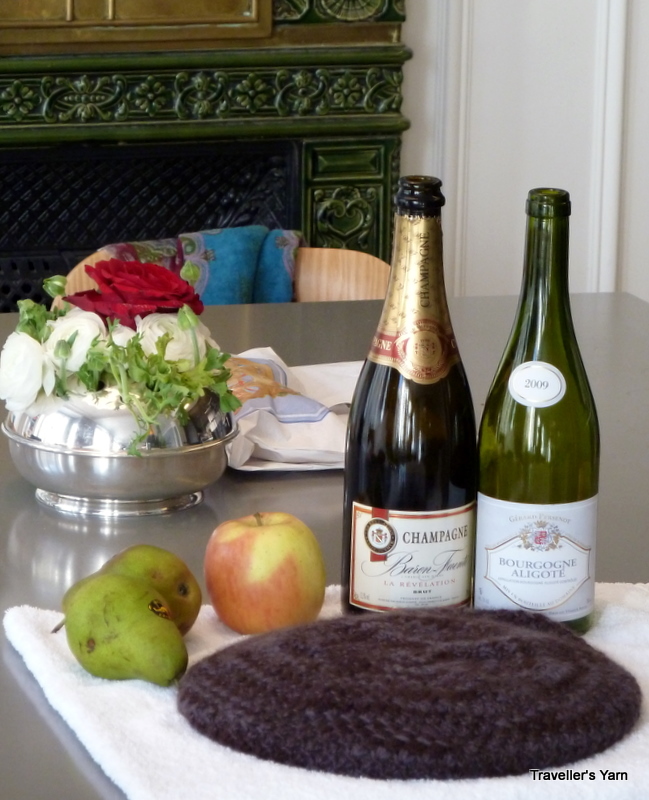 Instead, I present you with a Parisian still life: “worse hat (blocking)”. 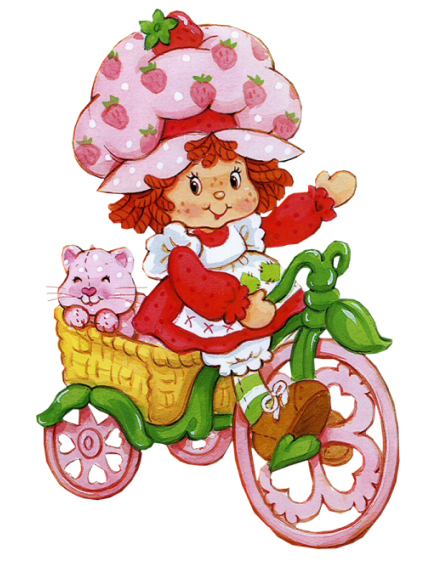 when I put it on, one of my darling children said that I looked like Strawberry Shortcake. When I summon the emotional energy, the hat will go to the frog pond, and be made into something else. The photos were inspired by my visit to the Heinrich Kuhn retrospective at the Orangerie, which I loved. Pattern: Remolino Hat (Ravelry link), by Melissa Goodale. Ravelry notes here. Needles: Knit Picks Acrylic interchangeables size 7.00 mm (apparently too large). Yarn: Lana Grossa Qui, saved from this frogged project. I still have two more posts on our Europe trip – we found a wonderful yarn shop in Paris and Rome, but couldn’t post while I was away because I forgot the cable for my new camera. While I love my Panasonic DMC-TZ10, you need to use a special custom cable to download photos, instead of a standard USB cable. Next time I am looking for a camera, I will make sure to check that you only need a standard USB to download photos. In other news, I am now sweltering through a Sydney heat wave, and have made the decision (in the absence of a buyer) to close down Yarn Workshop. I will sell all remaining stock on Ebay, or to anyone who cares to make an offer for more than 5kg (send emails to ingrid@yarnworkshop.com). I’m not planning to completely drop out of the knitting world, but need to cut back on the business if I am going to make a go of university life. I’ve decided to put Yarn Workshop on the market. To say that I am ambivalent about this decision is an understatement. I’ve really enjoyed running Yarn Workshop, I’ve loved meeting my customers and playing with lots of yarn, and I’ve really loved helping lots of people with the supplies for their own home based businesses. Since we moved back to Australia, I’ve been thinking a lot about the shape that my life should take. Being back in Sydney has reminded me of my former career in law, and I’ve felt increasingly pulled back towards the legal world. I’ve been fortunate enough to have been offered work next year teaching law to university students, and have decided to take it. While there was a part of me that wanted to teach law, and run the business, the saner side of me prevailed. So if you are interested in running a profitable yarn business, now is your chance! 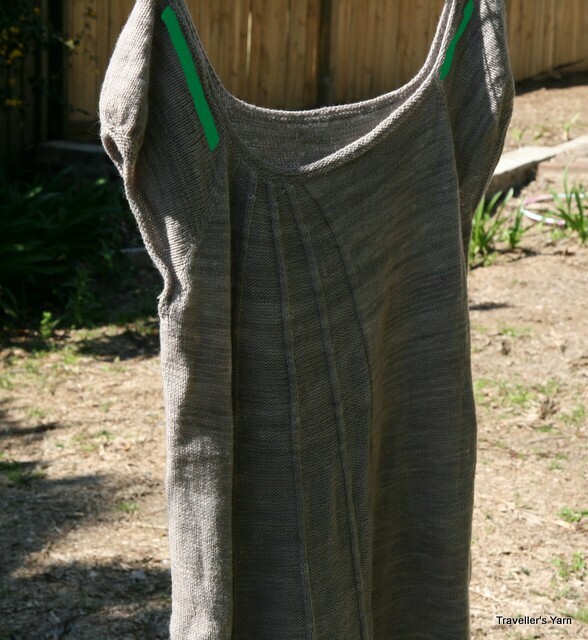 But there I have a beautifully knit Topstykke made from hand-dyed Grafton. I haven’t introduced Roz here before, but she helps me out in the business, and is a completely wonderful hand crafter – knitting, spinning, dyeing and quilting. She knitted this Topstykke for her daughter, but it was too large. Luckily, it fit me well, until I spilt tea on it. Then the issue arose. 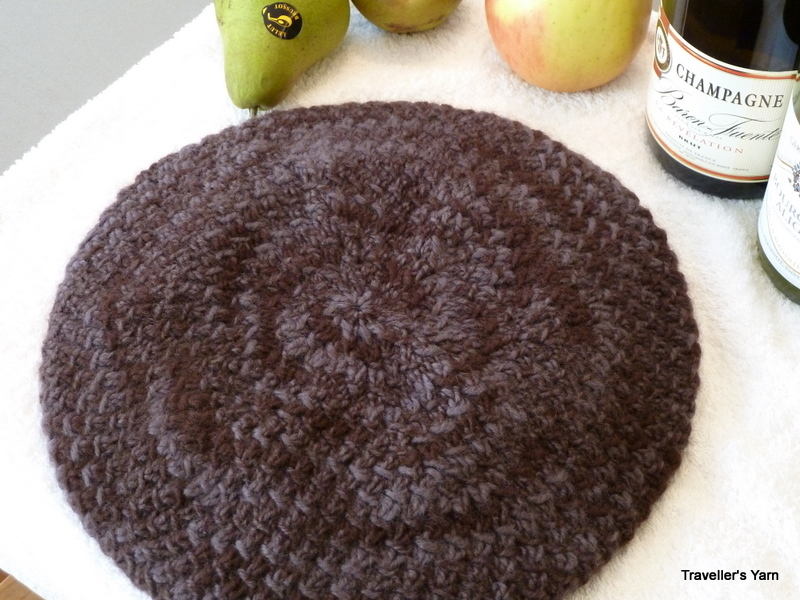 Now, I am not a newbie when it comes to washing handknits, I wash them carefully, and then spin them, and dry flat. The top is only on the coat hanger for my fairly pathetic attempt at photography. 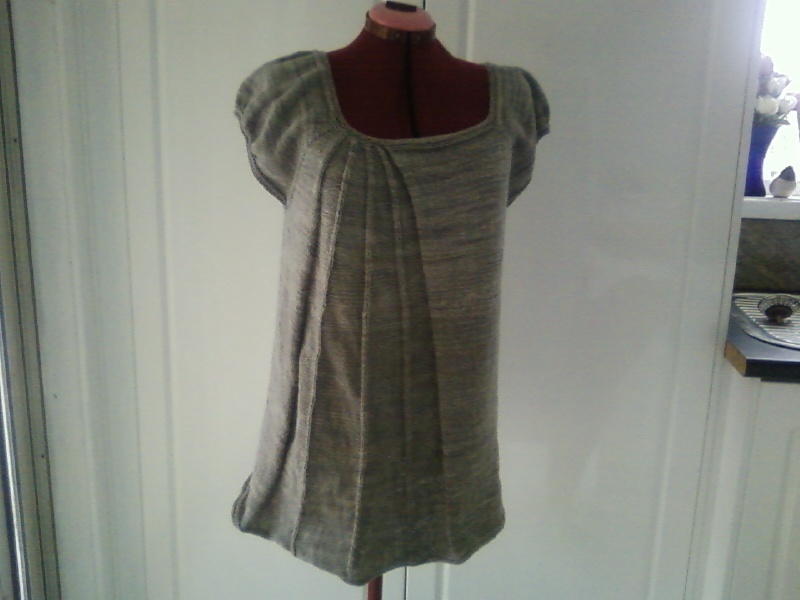 The neckline on this top has stretched tremendously after washing, especially across the shoulders. As I have commented before, I am lacking in the shoulder department, and this meant that the top is now pretty much unwearable. It might be a combination of the relatively inelastic yak hair, and the tendency of knitting to stretch across the grain. If you have ever worn a sweater where the sleeves are knitting widthwise you might have experience the phenomenon of forever growing sleeves. 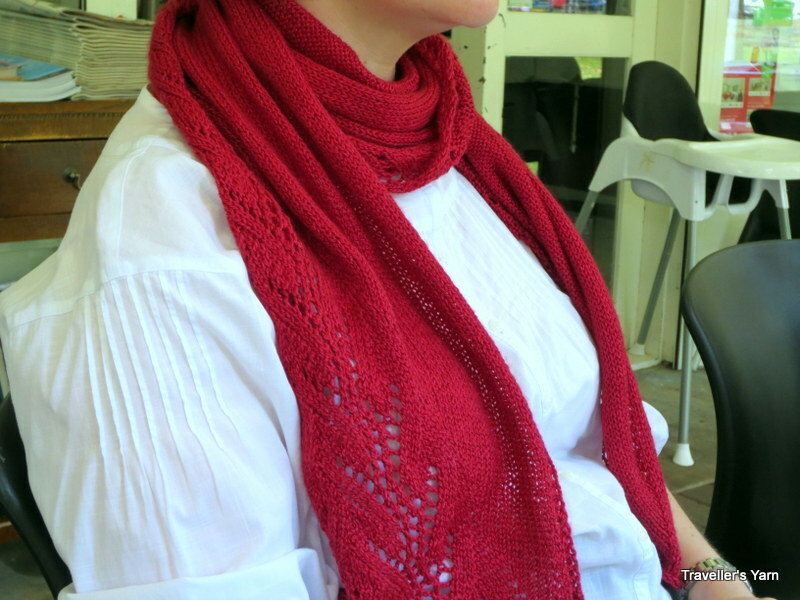 After consulting with Roz (also known as the brains trust), I’m going to pull a thread in the garter stitch around the neck, and re-knit upwards (and probable gather the sleeves more for some additional puff), and then secure everything with a crochet chain on the inside. 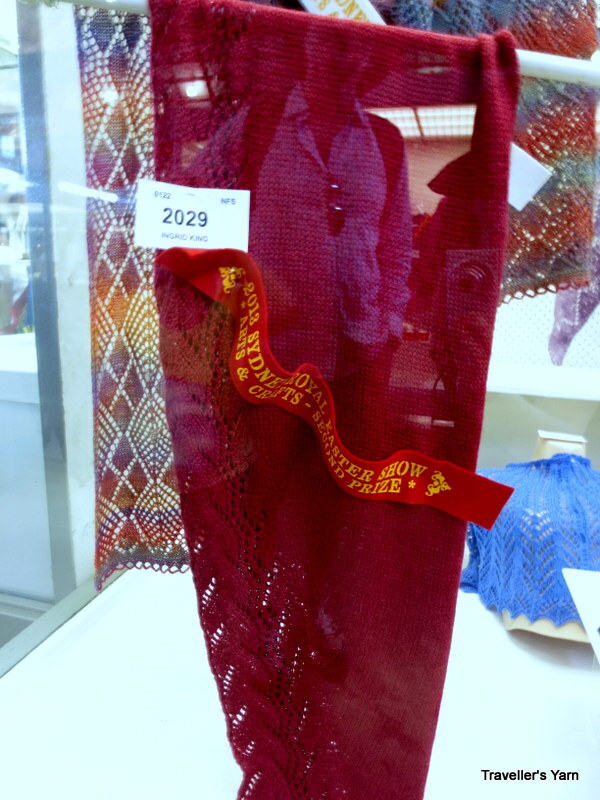 Just to prove that it is beautifully knit, here is a closeup. Now, once my Topstykke is fixed, I’ll wear it (quite a bit I think), but my enthusiasm for knitting the kit that I originally purchased has waned to nil. Anyone interested in purchasing a Topstykke kit that is only a little bit used (all yarn for sizes up to XL and pattern included)? The colour is petrol (which is rather more blue in real life) if you are keen, and a hefty discount on retail would be available. (especially if you are in Australia). Tips on a crochet chain to secure the neck would be free. Recently, I’ve been in a flurry of beginning projects. Unfortunately, project monogamy is a state I am completely unable to achieve. The Fireman is waiting, shivering, for his Seamless Hybrid, which now has a body completed to the armpits and an almost sleeve. The acres of stockinette were boring me silly, and the length of male arms is just ridiculous. I also have my Skater’s Over-top completed to the armpits (detect a theme there? 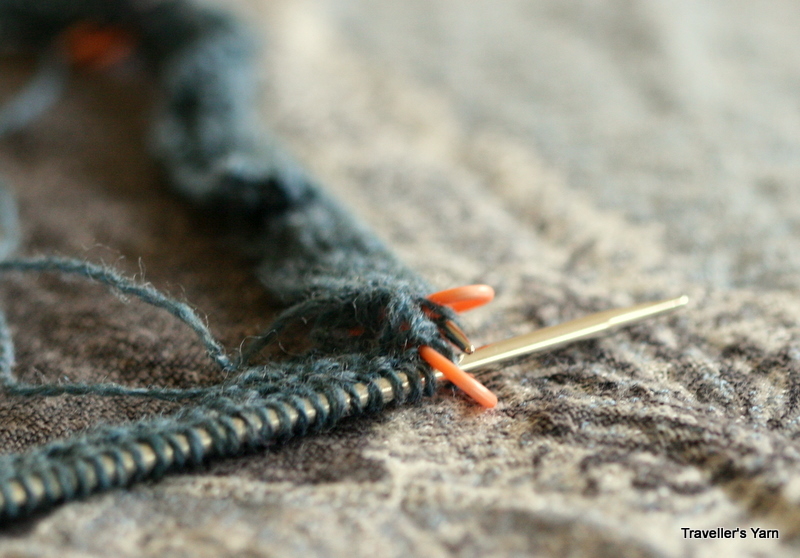 ), but completing that will require at least three hours of high concentration knitting. First, I need to frog the Kid-Silk Haze, and then pick up a zillion stitches, re-remember the lace stitch pattern and then, get the yoke happening. While some might suggest finishing a project or two, the more indulgent side of my personality has already researched the following set from Arpat Yarns. A somewhat belated report, but necessary, because I need to urge you all to visit next year. Wool Day in Canberra was wonderful, but I took no useful photos (partially due to the pain killers I was taking to get over a whiplash injury on the Friday night preceding). There were lots of interesting fibery products, including a fair range of hand-dyed yarns. I got to meet some people who I has only previously known through the internet, including Donna (battling a severe cold), Bells, Kylie, and Atholie. Atholie started talking to my sister and I, when I was trying to justify another purchase of green yarn from Ailsa. Who was I trying to kid? I love Ailsa’s greens, and don’t mind if I have many skeins that are similar, but ever so slightly different. I was startled by how low the prices were on many products – my sister bought a skein of hand dyed sock yarn for AUD$15. I purchased a splendiferous skein of 50% silk/50% Polwarth wool from this mob, and a 190 gram skein was only AUD $31! Now, I know that I sell yarn, but for the kind of artisanal yarn that these guys are producing – that’s a ridiculously low price. The yarn is worsted spun, and unbelievably lush. Thanks Bells for showing me your purchase! There were handspun skeins of wool that were gorgeous, for under $20. I purchased some gorgeous yarns, including the green one from Ailsa. Photos of those will have to wait, because whenever I think about it, its raining. On the home from Canberra we noticed a sign. It was like they knew that fibre obsessed people would be zooming down the freeway. 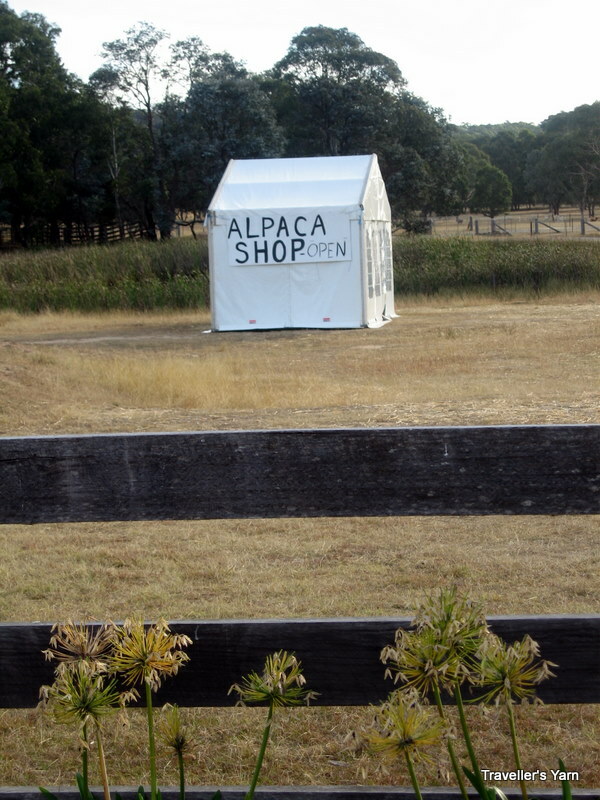 I was astonished – a freeway yarn shop in Australia? For that matter, a freeway yarn shop, anywhere?? We stopped, and a very friendly alpaca herder did tell us that the owners would open the shop for us, if we just gave them a call. We peeked through the window and could see yarn, clothing and blankets. While we were tempted, it was late Sunday afternoon, and we had no immediate need for further yarn. If we are traveling that way again, we will stop in – and call ahead. 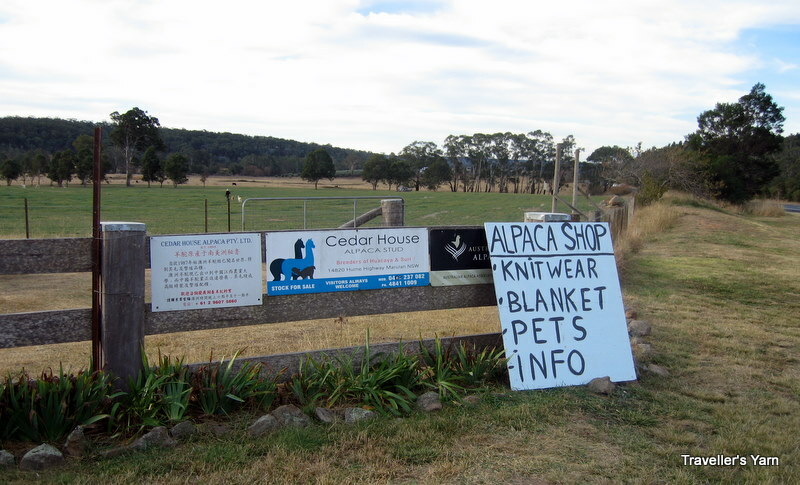 Looking at the website for Cedar House Alpacas, I see that their main business is breeding alpacas (that must be the “pets” above). 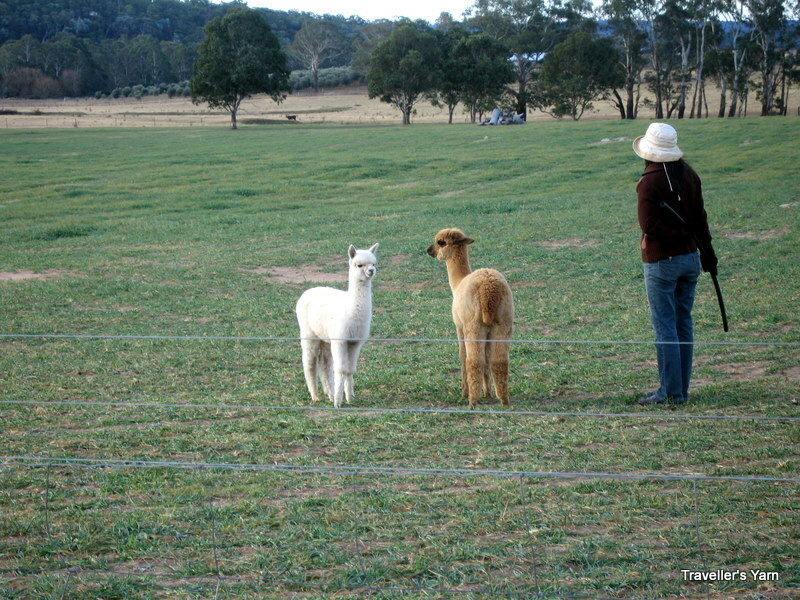 Maybe we won’t stop, apart from the fact that I don’t think livestock are allowed under our current lease, an alpaca in a suburban backyard? Although, just look at them, they are cute… Anyhow, Wool Day Canberra is worth the trip from Sydney. Apart from the fibre, there was lovely food, and I bought a fantastic guernsey that is fantastically warm (from Dowlings Country, who apparently do not have a website). I’m always up for a trip to the stomping grounds of my miss-spent youth. However, I would only recommend that you make it a day trip of you have a similarly wool obsessed traveling companion (3.5 hours there and back!). Luckily for me, my sister fits the bill.